I’ve been a fan of dill pickles for as long as I can remember. They’re a necessity at any cookout, a great salty late night snack, and are a staple in my fridge. My grandfather on my dad’s side made great pickles when I was a child, and eventually I plan on getting the recipe from him – once I begin to actually start canning, and when I have enough cucumbers in my garden to make a plentiful batch. It is not looking like my cucumbers will make it to the end of the month due to bugs (who feasted on my zucchini in July), so it won’t be this year. Canning is a very popular thing to do in northern Michigan, and I’m starting to become interested in jumping on the bandwagon. It’s not the equipment, nor the technique that worries me – it’s the time. My sister-in-law, who lives in North Dakota, has been canning for a while now; her salsa that she mailed us for Christmas was pretty great, and she sent me some packages of her dry mix as a sort of blessing/hint that ‘it’s easier than you think to make!’. So I promise…I’ll get there 🙂 But for now, my adventures in canning are very limited to refrigerator canning. Vegetables, brine, refrigerator, voila! I’m not sure if I’ve said it before, but the onions we receive from the farm are out of this world. Sweet, crunchy, and aromatic – nothing like the onions you buy in the dead of winter. In the beginning stages of my canning adventure, I did a lot of research on the subject and found that pickled onions are really, really easy to make – so I figured, why not try it with some of the wonderful onions that I have on hand? If you’re not a pickled-anything fan, then I’m sorry that this post is not up your alley. But for those of you open to the idea, read on! Divide the onion between two pint mason jars. In a bowl, combine vinegar, salt, dill and sugar. Mix until the sugar is dissolved. Place lid & band on jar, and screw tightly. Place in refrigerator. These are a great topping for hamburgers & hot dogs. They’re especially great with cucumbers, making an instant cucumber salad! Next time I try to make these, I plan on using a red onion, just to see how well they do. 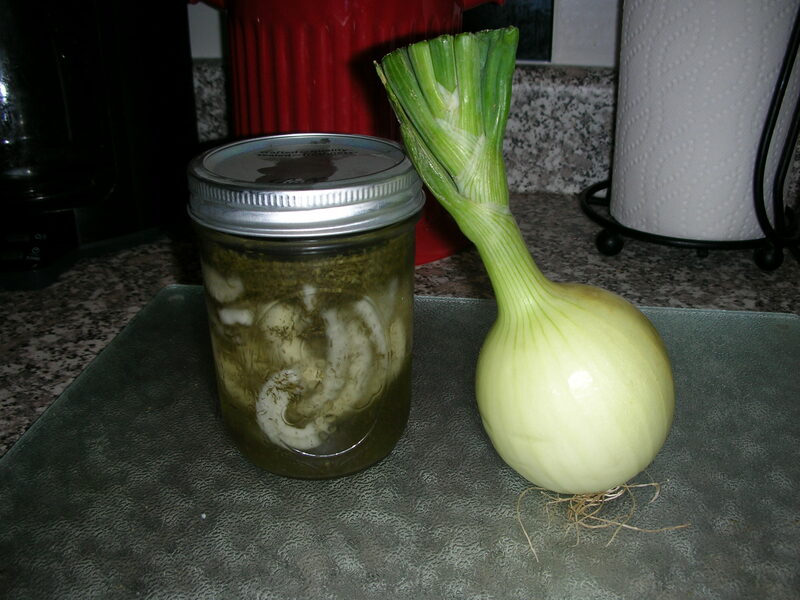 I still have one jar left in my fridge that I need to use up, but it’s a GREAT way to use farm-fresh onions from your CSA or farmer’s market.